Many organisations use the start of the New Year as an ideal time to reflect back on the previous twelve months and use this as an opportunity to recognise individual employee achievements and publicly thank these staff members in front of their peers. The number one reason that people leave companies is that they don't feel valued and this is mostly reflected in their relationship with their line manager. So this is a great idea, which should boost staff morale and increase productivity. However, why only use this great idea once a year? Task your managers with recording key staff achievements, ideas, input etc. and make sure they are thanked during the weekly or monthly team meetings. Use both internal and external media for recognition. An "employees of note" section on the canteen noticeboard, your website blog page, a newsletter story and a social media post are good stories for the public to learn about your company values. However, you must be consistent. A big fuss in February followed by nothing in March could demotivate those people who thought they deserved recognition in that month! Align the recognition process with your culture. For example, if you're a health and wellness company, maybe an award "prize" could be for gym membership, for example. Or the individual could prompt a corporate charity donation but made in their name etc. Walk the talk with your employees as though they were your best customers. Bang the drum for small victories more often! Whether it's our British reticence or perhaps a slightly cynical outlook on life, we shy away from celebrating "smaller" achievements. Create a "helping others" award. Some of your team will be more motivated by recognition that they help other team members than as standing out as a star performer. Why not also offer a "peer to peer" recognition system where team members can nominate each other as a "thank you" for their help. Be inventive - invite a caricaturist to capture the image of the chosen performer or keep it simple. Imagine the impact of a manager simply handwriting and posting a "thank you" card to a key team member. Don't wait for a ceremony! Encourage a culture of recognition on the spot and create some instant motivation for your team. 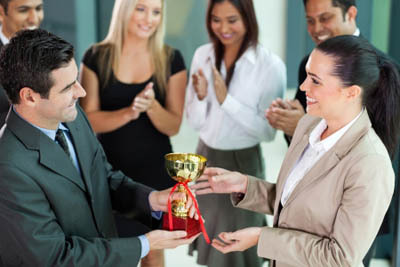 Done well, employee recognition acknowledges the hard work and achievements of your individuals and teams. It creates an emotional connection between your employees and your company and helps prove adherence to your company's values. Above all, it makes employees feel valued, respected, and even loved and therefore is far too important to restrict to only once a year! To work with a recruitment company whowill help you grow your business, call us for a chat on 01793 762026 or email Jackie and her team at: jackie@jackiekerrrecruitment.com.